These plans are offered through Lincoln Financial Group and AXA Advisors / PlanMember Services. All employees are eligible to participate immediately upon employment. Participants are fully vested in their contributions and earnings at all times. Upon enrollment, participants may designate a portion of their salary they wish to contribute up to the maximum annual contribution amount. ** Participant contributions are made through payroll deductions. Traditional 403(b) and 457(b) contributions are deducted on a pre-tax basis. Pay no taxes now on the money you invest, which lowers your taxable income right away. ROTH 403(b) and ROTH 457(b) deductions are post-tax payroll deductions. Pay taxes now on the money you invest, so you can enjoy a tax break later. 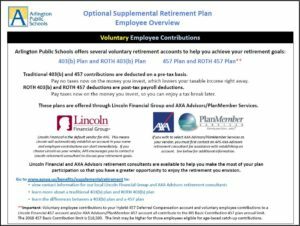 How is the Optional Supplemental Retirement Plan related to the School Board Match Program? Review the Optional Supplemental Retirement Plan and School Board Match Overview. Also, scroll down this page for more detailed information about the different types of retirement plans offered and more information about the School Board Match Program. How do I initiate or change the amount of my contribution, or terminate my contribution? Complete the applicable Salary Reduction Agreement (SRA) form and send your completed form directly to TSA Consulting Group, Inc. using the address, fax, or e-mail address located in the bottom, right corner of the form. Please complete all sections of the form and please remember to sign and date the form before submitting to TSA Consulting Group, Inc.
**Internal Revenue Service regulations limit the amount participants may contribute to tax-advantaged retirement plans and imposes substantial penalties for violating contribution limits. Plan administrative services for APS’ Supplemental Retirement Program are provided by TSA Consulting Group, Inc. TSA Consulting Group, Inc. monitors plan contributions and notifies APS in the event of an excess contribution. Service-Based and Age-Based catch-up provisions are available. **View the 2019 Annual Meaningful Notice for additional information. Participants are responsible for determining which investment vehicles best service their retirement objectives. Participant contributions are invested solely in accordance with the participant’s instructions. It is strongly recommended participants meet with Arlington Public School vendor representatives annually to ensure investment selections are still appropriate for the participant’s retirement objectives and to make any necessary adjustments. How do I contact our APS vendor representatives? View contact information for our Lincoln Financial and AXA Advisors/PlanMember Services vendor representatives. Traditional or ROTH, Which Plan is Right For You? How do I take a distribution, loan, or hardship withdrawal? How do I request a rollover? TSA Consulting Group, Inc. is Arlington Public Schools’ Third Party Administrator for our Supplemental Retirement Program. In that capacity, TSA Consulting Group, Inc. must process all transactions and distributions to ensure the transactions meet the regulatory guidelines of the IRS, as well as maintain records of those transactions. You must contact TSA Consulting Group, Inc. to request a loan or hardship withdrawal, and initiate rollovers into your APS 403(b) and 457 accounts. Retirees and former employees of APS must also contact TSA Consulting Group, Inc. to receive a distribution of any type. To get started, please review the TSA Consulting Group, Inc. Transaction Request Overview for Employees. You can also find additional information and forms on TSA Consulting Group’s website. Arlington Public Schools initiated a vendor change effective July 1, 2015. Please read this memo for more information regarding the changes. The list of previously approved TSA plan providers is still available, should you need to contact a vendor regarding investments made prior to January 1, 2009. Beginning with the February 28, 2017 paycheck, any cash match that you receive will stop going to TIAA and will instead go to whichever vendor you have chosen for your 403(b) or 457(b) account. Benefits-Eligible employees who contribute to an Arlington Public School’s 403(b), ROTH 403(b), 457, or ROTH 457 account are eligible to receive an APS School Board Match. The APS School Board matches up to 0.4% of your base salary, or up to $240 per year (up to $10/pay period if paid over 24 pays, or up to $12/pay period if paid over 20 pays), whichever is greater. School Board Match contributions are made as Employer Contributions in the employee’s name into a 403(b) account to whichever vendor (Lincoln Financial or AXA Advisors/PlanMember Services) you have chosen for your 403(b) or 457 account. To review your School Board Match account, contact your vendor, Lincoln Financial or AXA Advisors/PlanMember Services, directly. Go to the 403(b) & 457 vendor contact information page for more information. Prior to the February 28, 2017 paycheck, School Board Match contributions were paid in the employee’s name to a 401(a) defined contribution account with TIAA. The Committee was initially formed to draft an “Investment Policy Statement” (“IPS”) that guides the work of our outside financial consultant. The IPS is a document that sets the parameters to measure performance of the funds in each 403(b) vendor’s fund offerings. Each quarter, our outside consultants review the funds using a variety of factors listed in the IPS, and then reports to the Committee. The IPS contains seven evaluation criteria for the funds. Which funds are performing as expected. If a fund remains on the watch list for more than four quarters, the consultant will recommend that it be removed from the vendors fund offerings – in other words, it will be recommended that funds that consistently fail to meet the IPS criteria should no longer be offered to APS employees. The Committee has analyzed the current 403(b) plan service providers in order to understand and compare the service offerings, investment product structure, investment flexibility, fees and contract stipulations.